1Why Is The Rain Forest Wet? 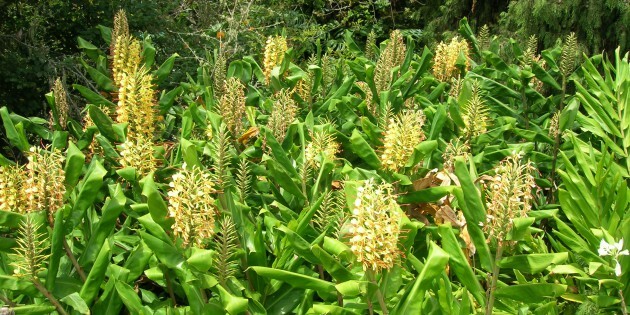 Invasive plants are a top concern of resource managers on Maui and the other Hawaiian Islands. The islands are highly vulnerable to invasion by nonnative (sometimes called “alien”) plants and animals because native island species have evolved in isolation from pressures routinely encountered by plants and animals on continents. The Hawaiian Islands currently have more than 10,000 introduced plant species, most of which grow only in cultivation. Over 1000 of these introduced plants now have reproducing populations in the wild. At least 100 of these nonnative plant species are considered by scientists and resource managers to pose a threat to native Hawaiian ecosystems because of their potential to displace native species and modify the ecosystem. But some people see certain nonnative plants in a different light than do resource managers. In this unit, students explore the role of values and perspectives in making decisions involving non-native plant species. They also learn about why some introduced plants are invasive while others are not and apply that knowledge in a management scenario. Students role-play different perspectives about a nonnative plant species and a proposal to ban the propagation and sale of this plant in Hawaiʻi. They explore different types of values and consider how those values might affect people’s decisions and actions. #2 - What Makes a Plant Invasive? Students learn about invasive plant characteristics and how those characteristics influence management decisions by completing homework reading, questions, and a class discussion. Students apply knowledge and information about invasive plants to a management scenario. Five and one-half class periods. 1. What are some different values and perspectives that people hold about nonnative plant species? 2. How do values and perspectives influence decisions about nonnative plant species? 3. What characteristics make some plant species invasive? 4. What threats do invasive plant species pose to native ecosystems? 5. What are some of the invasive plants of most concern to resource managers on East Maui? 6. How can resource managers set priorities for invasive plant management? Invasive plants and control measures. Values and decision-making. At least 100 of over 10,000 plant species that have been introduced to the Hawaiian Islands pose a threat to native Hawaiian ecosystems. Resource managers are concerned about these potential invaders, but some people see certain non-native plants in a different light. Differences in values and perspectives sometimes make decisions about invasive plant control difficult. • Research efforts among members of the East Maui Watershed Partnership to control invasive plants. The partnership is a collaborative effort among six public and private landowners and Maui County to protect the 100,000-acre rain forest core of this critical watershed. Online information about the partnership can be found online. Students may also want to contact the major partners directly: The Nature Conservancy, East Maui Irrigation Company, Hawaiʻi Department of Land and Natural Resources, National Park Service, Haleakalā Ranch, Hāna Ranch, and Maui County. • Conduct library and Internet research on the six invasive nonnative species highlighted in this unit (Activities #2 and #3) to find additional biological information or control strategies that would assist in developing management priorities. • Research existing public education and awareness campaigns about invasive nonnative species. Design a program, poster, or educational flyer for a species that is not covered in existing educational efforts or make suggestions for improving current campaigns. • Research the efforts of the Maui Invasive Species Committee (MISC) to prevent and control invasive nonnative plant and animal species on the island. Find beginning information about MISC on their website. Hawaiʻi Ecosystems at Risk This site is a central repository of information about invasive nonnative plants and nonnative animals in Hawaiʻi, including links to databases and other sites. It includes information about the Maui Invasive Species Committee, Coordinating Group on Alien Pest Species, and other state, national, and regional groups concerned with invasive species. Moanalua Gardens Foundation, Forest Treasures (CD-ROM), Moanalua Gardens Foundation, Honolulu, 2001. CD-ROM includes images of several invasive nonnative plants, as well as tools for students to create multimedia presentations. Smith, Clifford W., “Impact of Alien Plants on Hawaiʻi’s Native Biota.” This article describes nonnative plants in Hawaiʻi and the impacts associated with them, as well as strategies to ameliorate problems. Stone, Charles P., Clifford W. Smith, and J. Timothy Tunison, Alien Plant Invasions in Native Ecosystems of Hawaiʻi: Management and Research, University of Hawaiʻi Cooperative National Park Resources Studies Unit, Honolulu, 1992.